Latest edition of LifeNets eNews out today! My UCG member letter before Pentecost sent out June 4, 2014 talking about the genesis of the Christian church. LifeNets Australia helps fund school supplies, uniforms and shoes for Guatemalan children. See photos and report. LifeNets has worked with street children and orphans in Vinogradov, Ukraine since 2001. Here is a story of one of one young lady who we have known throughout this period of time. We visited Pastor Nikolai Gantiuk and his wife Angelina at Ukrainian Sabbatarian community in Willow Springs, Missouri on February 16, 2014. Great story! Mr. Leroy Neff dies January 28, 2014 at the age of 90. One of LifeNets successes in Malawi: the Jumpha Clinic. We have provided medicines for 10 years. The clinic is on the border with Zambia and Mozambique and provides healthcare for people in those countries, too. It is run by Cephas and Patricia Chapamba. We gave him a scholarship to get his Practioner degree. He is also LifeNets Malawi board chairman. Delivery of LifeNets Kids for Cows animals in Zambia. See report. Thanks to all who are making this happen! FOUR NEW Messages from Bill Bradford in Australia -- in our AUDIO section - Includes: God's Faith and Answered Prayer (part 2), Prince by Birth and Why Does it Mean to "Overcome?" September 23, 2013 update of LifeNets biggest project to date: The JohJan LifeNets Academy in Migori, Kenya that now has 220 pupils. The Minneapolis Church will celebrate its 50th anniversary September 5, 2013. Shown is the first pastor Sherwin McMichael with wife Beverly. We plan to be there. See MORE pictures and info. See latest edition (August 4, 2013) of LifeNets eNews here. Subscribe by asking for at enews@lifenets.org. Follow my trip to the Philippines July 10-22 on Travelpod. Just click here to get right to it. On March 19, 2013 we established the Dennis Luker Memorial Foundation in honor of our dear friend Dennis Luker who died on March 14, 2013. Along with his wife LeeAnn they ardently supported LifeNets education projects and we would like to memorialize his life with future education initiatives. Report on the LifeNets Kenya Goat Project funded by LifeNets Australia. We are so pleased to see people from different continents working together to bring about a higher quality of life. LifeNets member Neil Wallis participates in 7000 km road rally driving through 7 countries in Southern Africa, giving LifeNets exposure and giving out hundreds of pairs of shoes to poor people along the way. Great story! LifeNets establishes new service program in South Africa: Live Clean Program to be presented to groups of vulnerable children in order to provide them with a message of hope and practical techniques for daily living to alleviate emotional and mental suffering. It will be headed by LifeNets Southern Africa chairman, Monique Webster. LifeNets newest orphanage project in western Zambia. Here is Derrick Pringle of Kitwe, Zambia delivering $4000 worth of goods to orphans as well as poor Zambian/Angolan farmers. We are very happy to be involved in working with these reliable people. FOUR NEW Messages from Bill Bradford in Australia -- in our AUDIO section - Subjects: The Bait, The Election, God's Model for Eternity, What Are You Running From? Follow my January 7-22 trip visiting Zambia, Zimbabwe and South Africa on my Travelpod Blog right here! Prophetic Times is back! Author Jim Tuck had been ill, but is now back producing this interesting newsletter with insights into the signs of our times. Please come back and become a regular reader at http://kubik.org/pt Last issue is December 22. See back issues going back to October when he started doing them again. SIX NEW Interesting Messages from Bill Bradford in Australia -- in our AUDIO section - Subjects: Cooperation vs. Competition, The Law of Recovery, Slowly Let in Slip Away, One Man's Transformation, and MORE! LifeNets 2011 Annual Report is now online. See a summary of our activities and financial report for the last reporting year. LifeNets drills challenging borehole in remote Nalubanda North in Zambia on July 22, 2012. Success came after dreaming about it for 12 years! Will serve up to 500 people in community....on UCG deacon Maxwell Kasakantu's property. Share in our rejoicing by reading this inspiring report! SEVEN NEW Messages from Bill Bradford in Australia -- in our AUDIO section - Subjects: Why We Go Through the Wilderness, Developing the Mind of Christ, Solution Through the Unsolvable, Power, Love and Sound Mind and MORE! Our PRISON page has been reactivated. Would you like to write to some who seriously would like contact and fellowship? Omaha teens helping send humanitarian items to Malawi, third poorest country in the world. MORE. Greg Rorem, one of five working on LifeNets Project with Vinogradov children in western Ukraine from July 3-18. This is the fourth of year of this valuable program and you can read more about it here. The latest edition (June 4, 2012) is now online. You can also subscribe here for your own copy. We have met our goal of raising $6000 for the Kosele Dunya Orphans School in Kenya. See story at www.lifenets.org/kosele. Scholarship successes. 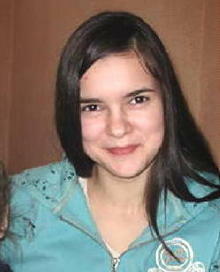 LifeNets Developing Nations Scholarship student studying to become dental technician in Ukraine. MORE! UCG home office employees Milan and Sarah Bizic along with Jonathan Magee will travel to Guatemala to assist in a joint Good Works, LifeNets and Youth Corps project. The main goal of the project will be to establish hydroponic and organic farming infrastructure to be to produce food for personal use and to sell. Have you discovered United Church of God's VCM? It's an online magazine with short informative/inspirational articles about life. Try it out here or clicking on the image above. Wowsers! SIX MORE NEW Messages from Bill Bradford in Australia -- in our AUDIO section - Subjects: Stress, Family, How to Develop a Relationship With God and MORE! LifeNets inaugurates a cattle project in northern Brazil in late 2011. Giovane Macedo and Laura Macedo from Montes Claros, Minas Gerais, Brazil are very grateful for the LifeNets scholarship that they are receiving to help them in their graduate studies. Read update about our most successful LifeNets program. My mother Nina Kubik (below) lived through the 1933 Stalin famine in Ukraine that killed seven million people. I recently found this article in a 1983 issue of the Minnesota Daily News in which she was interviewed about the famine.....50th anniversary of this event. 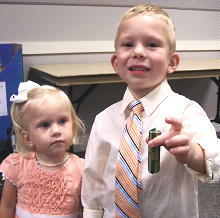 LifeNets helps sponsor Leigh Ann Gholson Mission to Guatemala Sept 30-Oct 7, 2011 - Great story! Update about UCG's Winter Family Weekend in Cincinnati, Ohio. Today's update on UCG member's stolen cattle in Zambia. Police order the return of ALL stolen cattle to LifeNets beneficiaries. Thank you for your prayers protecting families livelihood! Update on Zambia UCG member's cattle thefts. GREAT NEWS! Police order return of cattle taken from LifeNets beneficiaries. NEW!! Messages from Bill Bradford in Australia -- in our AUDIO section -- Why Are We Losing? Where the Debt Crisis is Leading in World Affairs? Update on Zambia UCG member's cattle thefts. In Zambia UCG members' cattle from a number of families is stolen. You urgent prayers sought. 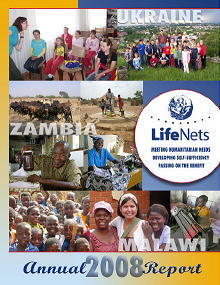 Read about LifeNets work in Zambia since 2000. Lafayette, IN United Church of God members serve dinners to formerly homeless people in Lafayette, IN. Read the story. NEW Prophetic Times July 30 - Ahmadinejad: Iranian, Iraqi nations have common enemies, Possible Ft. Hood Attack Thwarted?, Disunited in Hunger, The Euro Crisis Will Give Germany the Empire It's Always Dreamed Of, Ex-CIA Officer: Israel Likely to Attack Iran in the Fall, Fed and Wall Street Prepare For Default. See the latest July 17 issue here! Evangelistic work of the Transcarpathian Church in Khust, Ukraine in Greater Eastern Ukraine. Read about Vasyl Mondich's most recent journeys and Work. LifeNets electric fans arrive in the Fukushima area of Japan. It has been very hot and humid and people are afraid to run air conditioners for fear of nuclear contamination circulated into the their homes. Please read latest accounts (July 12) about how we are helping people affected by the earthquake in Japan. UCG 2011 Winter Family Weekend at Great Wolf Lodge in the Cincinnati/Mason, Ohio area. WOW!! See more info!! Victims of the March 11 Japanese earthquake and tsunami in Japan express their gratitude to LifeNets supporters who helped them and their families. Please read latest accounts (June 25) about how we are helping people affected by the earthquake in Japan. NEW!! SEVEN messages from Bill Bradford in Australia -- in our AUDIO section -- posted June 14, 2011. Listen to them from my home page. Kenny Graves of Houston, Texas, is working in Illinois and attends the Terre Haute, Indiana United Church of God. He does music in our congregation regularly. On June 4, 2011 he sang his own composition "Sabbath" that I'd like to share with you. UPDATE on the Feast in Estonia. Marriage between a man and woman is one thing, but does God have even a bigger marriage plan? A friend of mine wrote this book based on his life. Knowing him, it was very interesting, revealing and moving to me. Update by Dr. Yumi Yamamoto from Japan about eyeglasses distribution for those in need. Updates by Dr. Yumi Yamamoto from Japan about the trials the nation is suffering. NEW Prophetic Times April 2 - News: China, Europe, Israel, Nuclear bombs and debt. It's been almost 25 years since the Chernobyl nuclear disaster. We have been working with and are a part of the "Revival" Centre in Chernihev, Ukraine since April 1996-- before it opened in June of that year. See latest updates and photos. We have been working with and are a part of the "Revival" Centre in Chernihev, Ukraine since April 1996-- before it opened in June of that year. We have traveled there many times and have become dear friends of Dr. Vasyl Pasichnyk and his wife Natalya who are founders and directors of a children's rehabilitation center 30 miles due east of Chernobyl. It has treated thousands of children for various ailments and serious health conditions for the past 15 years. The causes of many disabilities that have been passed onto another generation now, go back to the fateful day on April 26, 1986 when fateful nuclear accident took place. It awakened and sobered our world to the dangers of nuclear power. LifeNets continues to help the center on an annual basis. See remarkable award-winning video produced by 16-year old Jonathan McClure about the Chernobyl nuclear accident 25 years ago. The current Japanese crisis bears eerie resemblance. Jonathan is the son of UCG members Malcolm and Cathy McClure of the Lafayette, IN congregation on a LifeNets Mission in January 2003. Jonathan won first place in Indiana contest for video. LifeNets will be helping with earthquake victims and will facilitate relief to victims through our friends in Japan. You can donate on our Japan page. 100% of donations will go towards relief. My niece Natasha shares her story about Mission to India in January 2011. The last 4 Prophetic Times from February 19-March 12 just posted! The Foundations Will Be Tested. Annual report about LifeNets Heifer Project that has expanded into Kenya. We are so excited about how well this project is managed and the wonderful outcomes. LifeNets helps upgrade equipment that it originally helped with in 2002 for Sierra Productions in Colombia. LifeNets mission is to help people in practical ways that lead to self-sufficiency. MORE. Lafayette, IN Variety Show Feb 12. Starring Sam Howie, Mike Snyder, Michael Kubik, Elena Kubik, Rory Washburn, Winston Snyder, Katherine Rowland, Steven Rowland, Jamie Snyder, Meredith Keeney and many more in this multi-star production. We can only show you 13 minutes on YouTube. Progress continues on the construction of the JohJan LifeNets Academy in Migori, Kenya. This is one of five buildings built. See progress report at http://lifenets.org/johjan. We are very excited about the work being done! Families for God Weekend and Teen Prom April 1-3, 2011 in Minneapolis/St. Paul Be sure to visit our special website and register at: http://FamiliesforGod.org. The last SIX Prophetic Times from December 25 - February 12 just posted! Notice of the death of Dr. Kermit Nelson who was a special person to many of us. (Feb. 10). Important letter from UCG President and Council Chairman in the wake of three COE resignations. Our Travelpod entries for trip to September/October trip to Malawi and Zambia is DONE! Roderick Thungula of Lilongwe, Malawi is one of LifeNets many successful scholarship students. Read descriptions of him and two other recent students that LifeNets sponsors See updated story about LifeNets scholarship fund. NEW!! FOUR messages from Bill Bradford in Australia -- in our AUDIO section -- some are very timely for right now. LifeNets helps in aftermath of January 12 Haiti Earthquake. Updates on the LifeNets Wheelchair Project http://lifenets.org/wheelchair New donations and testimonials from beneficiaries and donors. Below: My beautiful Autumn bike ride Friday afternoon October 15, 2010 in Indianapolis, Indiana. LifeNets launches NEW Heifer program to improve quality of life and standard of living in Kenya. Read first report about this exciting new initiative based on our Zambia success model. Meet one of our newest LifeNets Developing Nations Scholarship Fund students Ani Poghosyan from Armenia. She lives and studies in Armenia. She is studying for a degree in modern languages. NEWEST Prophetic Times October 9 -- Growing ties between Turkey, China, Iran worry Israel and US; N. Korea's nuclear threat reaches "alarming level"; Banks' $4 trillion debts are 'Achillies” heel of the economic recovery' warns IMF; Dollar set for sharp decline, Goldman forecasts; IMF chief says China, others may see currency as a weapon; Coldest winter in 1,000 years on its way. What Kind of Authority Do You Have? Building shop for seamstress Jessie Nyalubwe (LifeNets) in Lilongwe, Malawi to sell her wares. Stories and YOUTUBES from 2010 that were on this Home Page have been moved to another site.....looking for something? Oasis of LifeNets School opens on July 7, 2010. Read the story and see photos of the last few months progress leading to the opening. We are thrilled to see this project well on its way and serving the first students. Fifth Annual Mandan, North Dakota LifeNets Triathlon August 22, 2010. Great success! See story and pictures! LifeNets is finally registered as a non-governmental organization (NGO) in Malalwi on July 12, 2010. More. Is the Pursuit of Happiness a God-Given Right? ADS that just wouldn't work anymore...but they DID at one time in our lives! Janice Spieker, wife of UCG elder Harlan Spieker died Thursday, August 26, 2010. See more. One of LifeNets newest Developing Nations Scholarship students - Gabriella in Vinogradov, Ukraine who will start study to become a dental technician. See updated story about LifeNets scholarship fund. Miss Washington, Devanni Partridge, promotes LifeNets at Seattle Rotary fundraiser on April 17, 2010. It was a fantastic evening that helped raise more than $11,200 for building the JohJan LifeNets school in Migori, Kenya. See story and photos of our biggest fundraiser to date. Highlights of a Ukrainian wedding on June 6, 2010 in Spokane, Washington. Our dear friends' son Ivan Yurishko, Jr from Khust, Ukraine marries Angelica Sederova from Winnipeg, Manitoba, Canada. The wedding was held in Spokane where most of the families could meet and where many friends from Portland, Sacramento and Seattle could attend. See this YouTube version focusing on the music that Ukrainians are noted for. Ivan and Angelica will make their life together in Khust, Ukraine. NEWEST Prophetic Times August 21 -- Lots of Iran and Gulf tensions--reaching flash point with Iran? NEW Prophetic Times from June 26 - August 14 -- Sorry about being a bit slow regarding posting of late. Springfield Gardens, New York fundraiser for LifeNets Orphan Care Centre in Balaka, Malawi. See story and photos about this interesting event! Event was held on June 27, 2010. On June 27th the 3rd Annual New York City area fundraiser was held for the LifeNets Orphan Care Centre in Balaka, Malawi. The organizer and host for this summer's event was JoAnn Hawker who lives in Springfield Gardens and works in Manhattan. About $3000 was raised towards this program that started in 2003. See some of the highlights and interesting points about this aspect of LifeNets' work. JoAnn Hawker, Dr. Barbara Walls and Beverly Kubik speak. Update on the new LifeNets project: The JohJan lifeNets Academy in Migori, Kenya. Still looking for a unique setting in which to keep the Feast Of Tabernacles? Space is available on the island of Saaremaa, Estonia. lunch will be held each day. Saaremaa can be reached by bus/ferry or a short flight costing approximately $40 one way from Estonia's capital city Tallinn. Restaurants, shops, and other sites are within walking distance. If a taxi is needed, prices are very reasonable. Come and join brethren from six nations for a memorable and enjoyable Feast of Tabernacles. For more information, contact fotestonia@gmail.com and call Johnnie Lambert at 607 796-2660. New President for the Untied Church of God is Dennis Luker. He was selected by the UCG Council of Elders at 12:30 PM on June 24. At the 2nd Annual Concert for God by the Terre Haute and Lafayette, Indiana United Church of God, the Maria Howie dances "Amazing Grace" accompanied by her vocalist husband Tim Howie. Date: May 22, 2010 at McCormick's Creek State Park in Indiana. It was Pentecost weekend. Poem written by Terre Haute, IN UCG member Peggy Huckstep The Story of Man. Illustrated by one of our children. Clever. NEW!! FIVE messages from Bill Bradford in Australia -- in our AUDIO section: Out of Love, The Mindset and THREE MORE! NEW Prophetic Times June 5 Syria Nuclear?, Anti-Israel sentiment grows, world currency to rival $, Hungarian currency tanking, US to join S. Korea in military exercise and more. 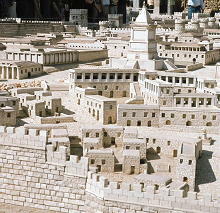 This guided tour of biblical Israel was sponsored by Ambassador Bible Center (ABC). The tour starts in Tel Aviv then we will use the Sea of Galilee as our base of operation for several days. The last five days were in Jerusalem including the Day of Pentecost. Africa Start-Up links Seattle University and Malawi university students to start business training courses for LifeNets grant recipients and other entrepreneurs this September. See Christina's video from her work in Malawi last year and MORE about this wonderful venture. NEW Prophetic Times May 15 and May 22 -- Euro bailout, Euro failing? Ocean fish disappear?. Iran prepared to block Gulf Oil and more news! Are You Protected by the Ultimate Security System? How Can You Avoid Provoking Your Child to Anger? ABC Choir Visits Lafayette, IN United Church of God on May 8, 2010....Hear their inspiring music and see story of their visit! Shortly after birth Naomi developed Athetoid Cerebral Palsy due to severe jaundice, resulting in damage to her basal ganglia located in the mid-brain. She is presently three years old and after many different therapies she can now hold her head up for most of the time, sometimes roll over, and more effectively cough and swallow. One of the therapies she is using, Hyperbaric Oxygen Therapy (HBOT), helps those with Cerebral Palsy by bringing extra oxygen to damaged brain cells. If this treatment is started early and is done frequently, these dormant cells can begin to function and this contributes to significantly improved CP symptoms. NEW Prophetic Times April 24 (also see April 17th issue)-- Iran in Venezuela? Syria fearing Israeli-Syria war, Earthquake in Tonga, .Greece taking financial battering again, NATO: missile defense needed against irrational players, potentially deadly fungus spreading in US and Canada. Promotional video about LifeNets explainingour origins and programs. It was made to be shown for Seattle Skyline Rotary's fundraiser on April 17, 2010. In the Lafayette, Indiana United Church of God we have a Change for Change jar to collect change for a LifeNets project, in this case the Street Kids in Vinogradov, Ukraine. A few members from this area traveled there to help teach English as a Second Language and help with a Day Camp. Would you like a laminated poster to put into a jar. Write to us at change@lifenets.org for poster and instructions. Thanks! Schoolteacher couple with a dream to build and manage a school with the help of LifeNets. Construction of the new Oasis of LifeNets nursery school in Lilongwe, Malawi. NEW Prophetic Times April 3-- Western Policy in Mideast a failure, Obama resigns himself to nuclear Iran, Undersea volcano threatens Italy, India launches biometric census for its 1.2 billion people, Proton collider ushering in new science? Update on our Development Project For low-income Children in Paramirabo, Suriname. In 2010 we provide not only food, but music training available to 40 children. NEW!! Some great messages from Bill Bradford in Australia -- THREE NEW Bill Bradford sermons from Australia in our AUDIO section: Our Responsibility in Tragedy, Crisis in Confidence, Obedience--the Neglected Part. The latest edition (March 26, 2010)is now online. You can also subscribe there for your own copy. The 2010 Triathlon August 22nd and its different this year: you can be part of it no matter where you live. Visit LifeNets North Dakota Web site. On our LifeNets Website see a history of our Triathlons since 2005. NEW Prophetic Times for March 27-- Israel pressed to bring goodwill, Netanyahu humiliated at White House, Saudi's complain of Israel's arrogance, gold prices sinking, Iran anti-missile launch succeeds, Pope implicated in cover-up. On February 10, 2010 a building was purchased for the Terre Haute, Indiana United Church of God congregation. This video clip shows some of the work that was done by enthusiastic Church volunteers. We are very blessed and thankful for this place to worship. What mobility means to a woman in Balaka, Malawi. See Story and more photos. Visit our LifeNets Wheelchair site. NEW Prophetic Times March 20-- China in great Bubble?, US wanting Israeli regime change?, N. Korea with 1000 missiles, Greece in financial trouble, German arms exports double, US modernizing nukes? LifeNets assists UCG members in the Philippines who suffered property and livelihood loss in the Super Typhoon "Parma" that raged for three weeks last October/November. Read a few testimonials from those helped. NEW Prophetic Times March 13-- Russia and India jointly develop fighter, Iran and Israel play cat and mouse, budget deficit sets record in February, brain scan can read people's thoughts, religious hatred, poverty behind Nigeria violence. Our visit to the Big Sandy United Church of God on March 6, 2010. See more. 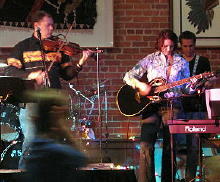 March 6, 2010 Boot Scoot for LifeNets Developing Nations Scholarship Fund in Ft. Worth, Texas. See YouTube video below. NEW Prophetic Times March 6 -- Iran: Nukes are a religious obligation, NATO futures dwindles, US backs off sanctions to Iran, Chile earthquakes changes earth, Iran making smart bombs. President of Ukraine Victor Yuschenko visits Revival Center near Chernobyl on January 11, 2010. LifeNets helped with the startup of this center and continues to help it to this day. Delivery of first goats for LifeNets Orphan Care Centre in Balaka, Malawi. See story and photos. Kambani Banda, LifeNets Zambia director gives report about 2009 successes in our total agricultural program that provides cattle, water, farm credit, scholarships and more. NEW Prophetic Times February 13 -- Lebanon/Israel tension, China #1 Exporter, Germany calls for removal of US missiles, Iran to initiate 2 new nuclear sites this year, Greece a financial mess, Iran: Finish off Israel if it attacks. 3rd Annual Boot Scoot Barbecue Dinner and Auction Benefiting the LifeNets Developing Nations Scholarship Program -- March 6, 2010 at the Fort Worth Stockyards. MORE!! NEW Prophetic Times February 6 -- Bosom bombers, Iran slams US Defensive Missile Deployment in Gulf, Iran to launch satellite?, and....Venezuela and Israel news. NEW Prophetic Times January 30 -- Usual troubling news about Iran/Israel, Stem cells research--brain cells from skin cells, earthquakes most deadly disaster killer of the past decade. Wonderful report from Vasyl and Irian Polichko in Vinogradov, Ukraine who operate soup kitchen sponsored by LifeNets, summarizing 2009 activities. Another LifeNets borehole--this one providing fresh water to a community of 1000 people in Mulanje, Malawi. We thank our sponsors for improving the quality of life for these people. Your think English is easy? UCG member John Wennström of Oslo, Norway talks about his new life in the Church in the January 2010 issue of the United News. See it here NOW! Andre and Elize van Belkum have relocated to New Zealand. Andre headed LifeNets Southern Africa for nine years overseeing projects dealing with scholarships, camps and livelihood development in South Africa and Zimbabwe. 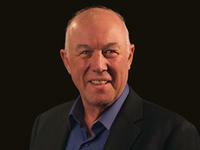 New director for LifeNets is Neville Smith. MORE. Below is a sampling of UCG's Winter Family Weekend in Louisville, KY December 22-27, 2009. Fun! United Church of God Winter Family Weekend in Louisville, KY December 23-27. One of the Seminars was God Wisdom is Full of Good Fruits. See lecture and discussion notes and go to Forum on this site for further discussion. From Zimbabwe Tshabalala reports on a new LifeNets goat project managed from South Africa. LifeNets volunteer Cherie Zahora writes about her summer experience of teaching Vinogradov, Ukraine street children and orphans English. Jeremy Lallier took LifeNets wheelchair to Kenya as part of the Youth Corps Project in late December 2009. Read more of his story. LifeNets volunteer Cindy Harper writes in the United News about her and her husband Dan's work in Vinogradov, Ukraine teaching English as a Second Language to orphans and street kids. Wonderful article! COLUMBUS, Ohio - Hopkins Printing is proud to announce it has been named a Best of the Best Workplace in America from the Printing Industries of America. 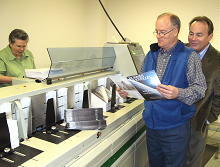 Hopkins Printing prints many of United Church of God's publications and has done special projects for LifeNets. MORE CONGRATULATIONS!! NEW Prophetic Times December 19 -- EU Foreign Policy Chief lambasts "Israeli Occupation," Iran test fires advanced missile, US National debt tops national debt limit, Gulf petro-powers launch currency in threat to dollar's hegemony, Experts concerned about the rise of US homegrown terrorism. UCG Council of Elders met from December 7 to December 10, 2009 in Cincinnati, Ohio. Go to reports. All reports are complete! A short treatise on Vengeance and Revenge by Nancy Guthrie. My report and photos of the Feast of Tabernacles in Estonia. Consider coming to Estonia next year! NEW Prophetic Times October 24-- Iran and Turkey top news. What are they up to next? New Crossword puzzle by Vic Kubik -- The Day of Atonement -- Do this INTERACTIVELY on this site, or download as PDF or Word Document. NEW Prophetic Times September 26-- Netanyahu wants UN to confront Iran, Europe now richer than North America, US will cut border patrol, US may face Armageddon if China and Japan don't buy debt, Al Qaida enters new stage in Saudi. NEW Prophetic Times September 19-- Iran working on Nukes, Latin America Arms Race?, Dismay in Europe as Obama ditches missile defense and more..
New Crossword puzzle by Vic Kubik -- What do you remember about Trumpets?-- Do this INTERACTIVELY on this site, or download as PDF or Word Document. TWO NEW Bill Bradford sermons from Australia in our AUDIO section: What the Devil Wants You To Believe and Can You Ever Repay God? NEW Prophetic Times September 12-- UN wants new global currency to replace dollar while China moves away from dollar reserves, Netanyahu planning attack?, Iran near getting the bomb and more. Another successful LifeNets livelihood project....a Mini Shop in Lilongwe, Malawi that is providing a good living for a family. Read this wonderful report by proprietor Wordsworth Rashid, UCG member. This is what LifeNets is all about! NEW Prophetic Times now available - September 5-- Russia supplies Syria with MIG jets while leader of Venezuela to arrive in Syria for talks, N.Korea in last stages of enriching uranium, Iran begins marketing nuke services and more. 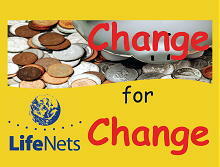 Would you like a laminated poster to collect change for LifeNets projects? Can easily be placed in school, work or church. We will gladly send you one if you request it at change@lifenets.org. Be sure to send us your name and address. LifeNets is ten years old today! NEW Prophetic Times now available - August 22-- UN Watchdog hiding evidence on Iran's nuclear program, Boeing unveils new anti-missile concept, Russian/Israeli leaders discuss Mideast Peace Plan, Iran ... and more. My Friend Paul Spenser Jamming....on May 16, 2009 when we were in Sweden. NEW Prophetic Times now available - August 15-- Cyber wars, Russia building new "Star Wars" missiles, China wards of 'Arms race in outer space" ... and more. The latest edition (August 13, 2009) is now online. You can also subscribe there for your own copy. 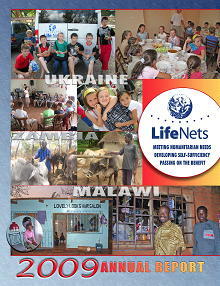 LifeNets Annual Report for 2008 released and mailed to 1500 supporters and donors on August 6th. See it online along with August 6th current newsletter in the LifeNets NEWSLETTER section. Subscribe for your own free copy. My clip of riding the ICE (Inter City Express) High Speed train from Bonn the Frankfurt at 300 km (186 miles per hour). Trip used to take 1.75 hours by car....now 37 minutes by this amazing train that made the German Autobahn look slow. Woo Hoo!! This woman in Salima, Malawi was hit by vehicle in this wheelchair. It became unusable. It sat for four years and she had to move around a big walking stick. No one came to help her. LifeNets became aware of her and repaired the unique hand operated wheelchair for $129. See story and photos. All Photos and Text Complete for June 28-July 16, 2009 Trip to Scandinavia and Ukraine. See all the Photos as albums. Lots of Photos. UPDATE on Lauren Graham, 21 year-old daughter UCG pastor Ken Graham critically injured in accident. MORE. New LifeNets North Dakota Web site! Announcing the 2009 Triathlon--it's different this year and you can be part of it no matter where you live. 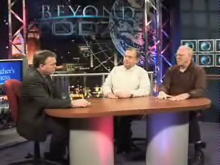 See Ralph and Pam June 22 interview on KFYR Bismarck TV along with video clip. NEW Prophetic Times now available - June 20 --US net work shrinks 1.3 Trillion in quarter 1, Oil prices leap to year's high, 21st century - flu pandemics.....and more..
FIVE NEW Bill Bradford sermons from Australia in our AUDIO section including Deep Conversion, Why Did God Have a Church?. How God's Purpose is Accomplished Through Christ and more. Surprise for Tom and Sue Peine who experienced a special 50th wedding anniversary commemoration celebrated by family and friends on Saturday night June 6. The Peine's have been loved and respected by many over the years. Tom Peine is a United Church of God elder in Lafayette, IN and LifeNets Chairman of the Board. See some photos! NEW Prophetic Times now available - June 6 --Dollar declining again, US ducks Bush support for Jewish cities in Yesha, Democracy seen threatened by new authoritarianism and more. See the latest LifeNets eNews -- JUNE 5. 2009....you can also subscribe to it. In Zimbabwe LifeNets installs submersible pump for church member Theresa Chichaya. She helps provide water for more than 50 other people who live on her property. See story. 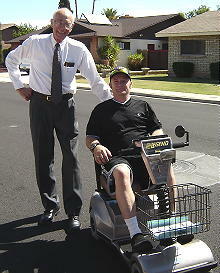 United Church of God elder Gerald Hoyer (right) helps deliver LifeNets wheelchair to recipient in Mesa, Arizona on May 31. See more here. Report about the latest habitat assistance to our brethren in Guatemala. Please see photos and report from UCG pastor Dr. Luis Mundo. See YouTube video excerpts from May 30 Concert for God at Pentecost Weekend for Terre Haute/Lafayette congregations. Right: Maria Howie performs modern dance selection. You can see the slide show given at the recent General Conference of Elders in Cincinnati, Ohio in various formats right here. NEW Prophetic Times now available - May 30 --Russia fears that North Korean conflict could go nuclear, China warns Federal Reserve about "printing money," Venezuela moves towards "Cuba-like" regime .... and more. New Crossword puzzle by Vic Kubik -- Pentecost --based on sermonette by Lafayette UCG member Ken Zahora along with solutions to former puzzles. NEW Prophetic Times now available - May 10 -- insight by Jim Tuck about our times..
General Conference of Elders in Cincinnati, Ohio on May 3-4. 2009. READ FULL REPORT. The latest edition (April 30 , 2009) is now online. You can also subscribe here for your own copy. Friend and co-worker in Eastern Europe, Johnnie Lambert undergoes a very difficult kneed replacement. Doing well. Time to Pray Valid advice in this poem I read from time to time. Special honor bestowed upon Tom Peine: friend, elder and much more by our Lafayette, IN Church. The Wonderful World Beyond Today! Great new blog by friend Mike Bennett at http://ucgmikebennett.wordpress.com/ Commentary on things going on and lots of practical stuff. Visit Mike! The latest edition (March 25, 2009) is now online. Get it! If you would like to be put on the mailing list write me with your name and email to iwantnews@kubik.org and I'll make sure you get our regular news by eNewsletter. We hosted our District Rotary's Group Study Exchange Group for lunch on March 23. They will be travelling to Malawi, Zambia and Zimbabwe on May 1 for 30 days. See LifeNets Blog. MORE. LifeNets on Facebook -- Become a FAN! Beverly Kubik speaking at Phoenix Women's Weekend on March 15, 2009 makes presentation "The Joy of Loving in Deed." Christina Davis writes her last blog entry from Malawi. Really great! She's on her way home TODAY. It's Finally Done! All photos and video clips have been posted for our last Eastern European/Nordic triip in January/February. View all the photos and clips as slide shows. Whew! Soundpost band performs at the Ft. Worth, TX Boot Scoot Fundraiser January 10, 2009 for the LifeNets Developing Nations Scholarship Fund which was a great success. More than 100 attended and about $5000 was raised. This will send three young adults to college for one full year in Malawi or Zambia. See report and photos. 1. Can You Lose Your Salvation? Panorama photo of Old City in Warsaw, Poland that I took on January 22, 2009. On our travel blog I have our Budapest and Warsaw photos all complete. New Crossword puzzle by Vic Kubik -- UCG Fundamental Belief #8 (Repentance) along with solutions to former puzzles. Christina Davis has done a great job for LifeNets on her Mission in Malawi. She's in the last week and writes another great report. Christina Davis posts another great post while on her mission in Malawi, Africa. While at the Council of Elders Meetings Councillors Paul Kieffer and Darris McNeely (right) observe the French Good News being stuffed into envelopes for immediate mailing on February 24th. Connie Seelig, manager, on left. Full Council reports will be available on about Tuesday, March 3rd. Please come back. The latest edition (February 22, 2009) is now online. At the bottom of this issue you can order it to come to your emailbox. It will be coming out about once a month. Get it! If you would like to be put on the mailing list send me an email with your name and email to iwantnews@kubik.org and I'll make sure you get our regular news about our Work in the areas you see above. 2009 FEAST OF TABERNACLES in Estonia this fall!! We invite you to join us. Please look at our first announcement. Rebecca's Well final update-- A Young Person's unselfish act that makes a big difference for a lot of ladies carrying water in water in Malawi. Christina Davis has great entry in her blog from Malawi about her investigative journey. NEW ZAMBIA Cattle, Agriculture, Medicine, Water Well and Scholarship Report rom LifeNets Zambia Director Kambani Banda. This report really tells the story of LifeNets successes in changing people's lives. 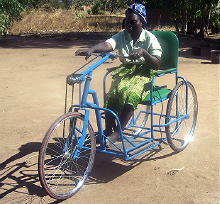 Another happy LifeNets wheelchair delivery--this time in Lilongwe, Malawi. Chiphale Njewa suffered stroke and has had no mobility for months. When we visited him in his home in October 2008 we promised a wheelchair. (See blog) It was delivered just before the end of 2008. Thanks to all who support the LifeNets Wheelchair Project. Updates at www.lifenets.org/wheelchair. We are always looking for wheelchair donations. We made our goal of 100 wheelchair matches for 2008. UCG ONLY: Ivan Veller's compilation of many UCG sermon archives and links to Webcasts and other good stuff. NEW SITE! On our visit to Vinogradov, Ukraine on January 18, 2009 at a sing-a-long children sang "As the Deer" along with us. The latest edition (January 22, 2009) is now online. At the bottom of this issue you can order it to come to your emailbox. It will be coming out about once a month. Get it! Clip of LifeNets Developing Nations Scholarship Fund students. See testimonials from young people whose lives are transformed by LifeNets. On YouTube: Teaching English as a Second Language. See how music is used as a powerful teaching tool at the LifeNets Summer 2008 project in teaching English as a Second Language in Vinogradov, Ukraine. You can also see higher quality WMV version. Also, go back to the entire story from this past summer. NEW YouTube Clip--2 minute clip of Sam Howie entertaining at Lafayette, IN Church Social last Saturday night. Follow Travel Blog for Kubik's January 2009 Trip to Eastern Europe and Baltics/Sweden. Itinerary of my next trip to Europe from January 13-Feburary 2. It will start in Budapest, Hungary and we will go to Ukraine, Poland, Latvia, Estonia and Sweden. See our NORDIC/BALTIC/EAST EUROPEAN Newsletter at www.kubik.org/ucgee. If you would like to be put on the mailing list send me an email with your namd and email to iwantnews@kubik.org and I'll make sure you get our regular news about our Work in the areas you see above. Prison update: Valdur Vesingi who is imprisoned in Tartu, Estonia. Report by Paul Dzing. Valdur is grateful for all the contact...writes to all in this post. See our prison page for more. Council of Elders meetings in Cincinnati December 15-18. Dr. Samuele Bacchiocchi dies on December 20, 2008. He was a prolific writer, speaker, and, defender of the 7th day Sabbath. MORE. See update to UCG's Web sites and blogs by all kinds of people. Snowed in today and couldn't make it to Church? 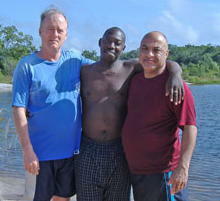 Listen to sermon by Kambani Banda given in Cincinnati, Ohio and Lafayette, Indiana about Zambia -- "The Hope Within Me." He speaks about how the United Church of God and LifeNets work together teaching similar values but in different ways. Audio and video versions available. See Kambani Banda's last report, too. Latvian Sabbath-keeper Antra Kikute writes an article in UCG's United News about how a Baptist church in Smiltene, Latvia now keeps not only the Sabbath, but all the Holy Days. They kept the Feast of Tabernacles by themselves this past fall. An inspiring story! Amanda Rupp of Youngstown, Ohio UCG helps coordinate calendar fundraiser for LifeNets Developing Nations Scholarship Fund that will benefit student in Ghana. The amount raised will pay for nearly a year of college. MORE. LifeNets Helps Save the Life of Matilda.....a Wonderful Story... At age two Matilda weighted as much as a newborn when she came to the LifeNets Orphan Care Centre in 2002. She is now alive and thriving. Please read about her and the LifeNets Orphan Care Centre in Balaka, Malawi. Entire Dental Office is donated by Dr. Andrew Benedetto of Palmdale, California to LifeNets. It was shipped to El Salvador where LifeNets helped establish a dental practice for Developing Nations Scholarship students back in 2001 for the United Church of God. MORE. Blankets donated to LifeNets by Whittier Alternative School in Sedalia, Missouri arrive in Balaka, Malawi and will be given to orphans. Shown above is Dr. Sam Chilopora and Beverly Kubik at the Chizeni Clinic on October 8, 2008. See the story. BLOG of our one-month trip October trip to Malawi, Zambia and South Africa is DONE!! Latest additions have been posted on November 21st. There are lots of photos and a few video clips to tell the story about the work of United Church of God and LifeNets in these countries. Please be sure to take a look at the updated entries. Lots more PHOTO UPDATES to my African Travelblog. All the text is done...finishing up photos!! We are leaving for trip to Malawi, Zambia, South Africa from October 2-29th. We will be at the Feast of Tabernacles in the first two countries. We will also follow up and report on all the LifeNets projects in those areas. Follow our trip on TravelPod by clicking here. Hilliar Belloc, UCG member, and wife Hti Mu celebrating move into their Habitat for Humanity home in Ft. Wayne. Indiana. The first of its kind in Fort Wayne, it is a cutting-edge, environmentally friendly "green" home. It was designed by IPFW (Indiana University Purdue University Ft. Wayne) students and the entire process was filmed to make a DVD for nationwide release to public television stations and for training volunteers across the whole Habitat for Humanity program. See more about this wonderful story and photos! Pam Redline, LifeNets North Dakota Chapter president speaking with Bruce Furness, former mayor of Fargo, North Dakota at the Far West Rotary Club the day after the LifeNets Triathlon September 8th. 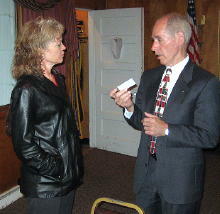 Pam and I gave the Club a report about the successful Triathlon to the Rotary Club. Bruce Furness was the featured speaker that day. He heads a Safety and Insurance Workforce commissioned by the Governor of North Dakota. Real Simple magazine, circulation 2,000,000, mentions LifeNets as a good place to go to to recycle your wheelchair. See Web version. Real Simple is a monthly women's interest magazine, which was launched by Time in 2000, features articles and information related to homekeeping, childcare, cooking and emotional wellbeing. 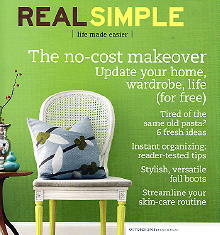 Real Simple is distinguished by its clean, uncluttered style of layout and photos. Vola Boaz, beloved by many, dies on September 9, 2008. MORE. Report and photos/video of the 2008 Mandan LifeNets Triathlon -- super event! Come visit spectacular large murals of urban art along the Monon Trail in Indianapolis. First posted in August 2007....take another look. Captain Jack Morehead of my Indianapolis Northeast Rotary Club. He is on the board of directors of the USS Indianapolis Memorial exhibit here in Indianapolis. On August 27, 2008 he spoke about the tragedy and about a special forgiveness extended by each side years after the fact. Click on image on the right to see the 2008 LifeNets Mandan Web site. You can now REGISTER for the September 7 event through Active.com Event coming soon!!! WHAT A STORY! Whittier Alternative School in Sedalia, Missouri collected blankets and toys for LifeNets earlier this year. All the items have now arrived in Malawi and will be greatly appreciated by the LifeNets Orphan Care Centre in Balaka. This action was inspired by the UCG NW Women's blanket project last year! Stefan Saxin from Gothenburg, Sweden was one of four people who worked for a LifeNets project teaching English as a Second Language and helping with a day camp for children coming from difficult circumstances. This was in Vinogradov Ukraine from June 16-27. Read his impressions and thoughts and see his wonderful photos! We will publish one more report: from Dan and Cindy Harper shortly. 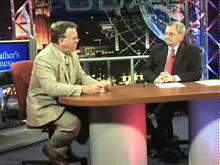 In the July 31, 2008 About My Father's Business UCG President Clyde Kilough interviews Jim Franks who just returned with us to visit Estonia and Sweden. Very interesting! Also see earlier interview with Victor Kubik and Johnnie Lambert about our work in Eastern Europe and Scandinavia from February 9 of this year. We're just finishing a spectacularly successful trip to Estonia and Sweden. We will be home later today (Tuesday) Our blog tells the story. Please come and visit. Dates of this journey are July 16 - July 29th. Summer 2008 LifeNets project in Vinogradov Ukraine was held from June 16-27 to teach children English and help with summer camp. Read his impressions and thoughts. This is the first of several reports from our volunteers that also included Dan and Cindy Harper from Cherbourg, France and Stefan Saxin from Gothenburg, Sweden. Gene Bremer, friend, deacon in the Jackson, TN UCG dies Saturday 7:32 am. LifeNets helps former orphan Godfrey with his studies at School of Mines in Zimbabwe. Read about some of LifeNets work in Zimbabwe. New book Homeschooling And The Only Child by Lorelei Nettles, Phoenix UCG member and managing editor of Virtual Christian Magazine (www.vcmagazine.org) Bob and Lorelei are long-time friends of ours. The book is marketed by BookLocker at http://www.booklocker.com/books/3410.html. You can read a sample PDF chapter also right here. For homeschoolers, consider joining Lorelei's forum--information below. New Home Schooling Forum moderated by UCG member and Virtual Christian Magazine managing editor Lorelei Nettles. To join go here or click into FORUMS on the above Navigation Bar. This is the sixth time we've done the Indianapolis NITE RIDE....a 20 mile ride through the heart of Indy between 11 PM and 1:00 on June 28-29, 2008. See 7 minute clip of my son Michael and me. Dr. Barbara Walls, UCG member in Piscataway, New Jersey organizes a most wonderful LifeNets Ladies Charity Tea on June 22, 2008. It was well-attended and provided funding for almost an entire year for the LifeNets Orphan Care Centre in Balaka, Malawi. Take a look at a few more photos and story about the event. New Crossword puzzle -- UCG Fundamental Belief #6 along with solutions to former puzzles. The ABC Choir visits the Lafayette, Indiana UCG congregation on June 14th and performs a number of inspirational anthems. We'd like to share some of them with you! New Home Schooling Forum moderated by UCG member and Virtual Christian Magazine managing editor Lorelei Nettles. To join go here. Latest Wheelchair Project news. We're well on the way to our 100 chair yearly goal. New Crossword Puzzle May 24 PENTECOST with solutions to previous puzzles. Andre van Belkum, LifeNets President of LifeNets South Africa, reports on Africa projects -- 2007-2008. Also, see the South Africa LifeNets Web site. NEW Jazz Clip! Things Ain't What They Used to Be. On July 23, 2003 I was able to record the last recording session of the beloved Hampton Sisters in Indianapolis. It was done at the Indiana Historical Society and produced their album The Hampton Sisters, a Jazz Tribute. Here is one more clip of that recording session with the selection "Things Ain't What They Used to Be." See earlier clip "Watermelon Man" See also 10 minute documentary by Jonathan McClure -- Indiana Jazz: Changing the Sights and Sounds of America. New Crossword Puzzle UCG Fundamental of Belief #5 Sin and God's Law with solutions to previous puzzles. UCG elder David Smith sends some spectacular photos of icebergs off Cape Spear in Newfoundland taken the first week of May, 2008. He says it's been a great season for sighting icebergs -- see them. New Crossword Puzzle today UCG Fundamental of Beliefs #4 Humanity -- with solutions to previous puzzles. Earth Day program at Park Tudor School in Indianapolis about LifeNets water wells in Malawi and Zambia. It was given by Cathy McClure and Victor Kubik on Friday, April 25, 2008. More. Kayleen Hannaways' home town newspaper reports. Kayleen Hannaway is in the FINAL TWO!!! If you voted, PLEASE COME BACK for the FINAL ROUND! Your click TODAY can help Kayleen Hannaway with this $20,000 scholarship! Mother and Daughter's Tea Party in Lafayette, IN on April 12, 2008. More--with video! Your click TODAY can help Kayleen Hannaway with a scholarship! To vote, please CLICK HERE and then click on the tab "Final Four". Then click on the "vote" link for Kayleen, and it will take you to a page with her profile, (along with the profile of her most direct competitor). That is where you can cast your vote for Kayleen. Only one vote, per computer, per round is allowed. You can vote any time between right now, and the morning of Wednesday, April 16th for this "Final Four" round. Below is a 4 minute clip from 8 mm film found of my Dad making pottery. He was a master artist who painted in various media, carved wood and made pottery at home. This was created an fired in our garage when we lived in West St. Paul, Minnesota. NEW LifeNets Online Newsletter dated April 2 -- would you like to subscribe to receive it electronically?? We would like your opinion on future articles for the Virtual Christian Magazine. Please take our poll on the FORUM. if you are not a member of the FORUM, you will have to register first before taking the poll. We would really like your thoughts! Brian Gallagher, CEO of the United Way of America speaks to the Indianapolis, Indiana Economic Club on February 21, 2008. He spoke about how social change comes from making programs people oriented and market driven away from institutional orientation and from being process driven. MORE. One of the Balaka, Malawi's area chiefs, Chief Mpulula thanks United Church of God Northwest Women, Li feNets and others for the their help to Malawi's orphans. Blankets, mosquito nets, food, medicine and more has been donated. 1977-2007- What a Difference 30 Years Makes! Have Solutions For You?, Effects of Cultural Shifts on the Church, Is Your Heart Still Hardened? 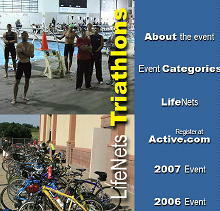 Mandan, North Dakota 2008 LifeNets Triathlon is planned for September 7....our Web site is up! Rebecca McClure (age 14) for her birthday told her friends that she wanted the gift to go toward a water well in Malawi that would help a lot of ladies who carry water for miles a day. $1000 was raised! What a wonderful unselfish spirit! See how great the disparity in food and size of family is between the "Have" and "Have Not" countries of the world. Artist Carmel Smith, daughter of UCG elder David Smith and his wife Blanche of St. John's Newfoundland talks about the opening of a new art gallery in Bridgewater Nova Scotia where she lives. Carmel and her mother write children's books. See this site's promo for Digger Donald that was distributed throughout bookstores in Canada. Chris Rowland of the Lafayette United Church of God is featured on Indianapolis PBS station WFYI on Across Indiana first aired on January 28, 2008. The segment is called Reuben Realm. You can watch the 4 minute segment by clicking on the links below. First update in nearly 4 years. On our HEALTH page Don Hooser talks about Food: We Can't Improve on God's Creation (posted January 25, 2008) See the site!!!! TravelPod blog with all entries and photos now complete. January 12, 2008 AD. Family Christian Club followed. MORE! On July 23, 2003 I recorded the Hampton Sisters making a CD recording. Here is one of my favorite: Watermelon Man. See it on YouTube below. Documentary by Jonathan McClure Indiana Jazz: Changing the Sights and Sounds of America featuring the Hampton Sisters. Tom Peine writes in the July 2001 United News about grandsons Jonathan's work on the award-winning documentary about the Hampton Sisters and Indiana jazz. Arielle Falardeau is UCG Youth Corp Volunteer who served in Ghana from August 10-20, 2007. Her trip was also sponsored by LifeNets. Read about her experiences. Wendy Jacobs, UCG member from Seattle, Washington on Operation Smile mission in Morocco. LifeNets helped sponsor her trip. See more photos and story about the mission. The Ozzie Engelbart Memorial Fund is now closed. We thank you for all the young people it impacted since 2001. LifeNets supplies 15 new Dell computers for Computer School in Transcarpathia, Ukraine operated by Sabbatarians and directed by Ivan Yurishko. Read story about our computer school project going continuously since November 2000. Visit to the NK alcohol/drug-free cafe in Tallinn, Estonia on the way home from the Feast of Tabernacles. LifeNets has supported the work of Lauri Beekman to help with a appalling problem with youth and alcohol. LifeNets continues to collect and distribute eyeglasses. At the UCG Home Office in Cincinnati, Ohio Janet Treadway and Larry Perkins help ship 560 pair of LifeNets glasses to Sri Lanka Tsunami victims on October 15, 2007. Life Now you can ALSO SHOP online and benefit LifeNets by clicking on the icon. To shop click on the icon or click here to go directly to shopping. It's EASY! 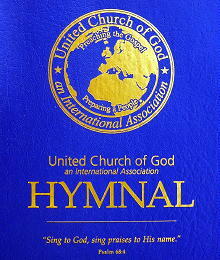 Do you need a conversion chart from old to new hymnal until the song-leader's and accompanists version comes out. Mike Wood of the Terre Haute UCG congregation created one. Paul and Kira Spenser distribute 2000 brochures in their hometown of Mjolby, Sweden advertising Are We Living in the End Times? See our latest Nordic Newsletter! A UCG Lafayette, IN deacon's wife, Katherine Rowland, writes publicly in her blog about why she keeps the Sabbath and Holy Days. Well done and worth a read. Do you remember the Muehlbauer family from Royalton, Minnesota? 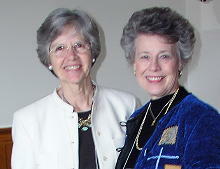 Here is a picture of twins Karen and Sharon at their mother Bernice's 80th Birthday party. Maybe you can help me out with some of the names on the photos?? Malawians Mark Phiri and Wife Agnes Katsonga Visit Ft. Wayne, Indiana in September 2007 and we spend day with them. On August 12, 2007, Dr Garvey Chilopora tied the knot with Gloria Milanzi in a colourful wedding, officiated by United Church of God minister Morgen Kriedmann. It was officiated in Chichiri, Blantyre, and thereafter a reception at the Mount Soche Hotel. See more photos. Dr. Garvey Chilopora is the son of Dr. Sam and Esther Chilopora of Ntcheu, Malawi. More Urban Art along the Monon Trail -- another series coming up! LifeNets volunteers Megan, Mariah and Marissa Fooshe finished a project for socks and shirts collected in the Nashville, TN for 26 shirts and 108 pair of socks that were sent to Mexico and Peru. Way to go! What if LifeNets earned a penny every time you searched the Internet? Well, now we can! GoodSearch.com is a new search engine that donates half its revenue, about a penny per search, to the charities its users designate. You use it just as you would any search engine, and it's powered by Yahoo!, so you get great results. Just go to www.goodsearch.com and be sure to enter LifeNets as the charity you want to support. Just 500 of us searching four times a day will raise about $7300 in a year without anyone spending a dime! And, be sure to spread the word! START NOW by clicking on the GoodSearch icon on the right! The Third Annual LifeNets Triathlon will be August 26, 2007 in Mandan, North Dakota--latest information. UCG Festival in Estonia in 2007.... master schedule updated. There is still room for more attendees for this exciting, inspiring, scenic Feast of Tabernacles in Estonia. 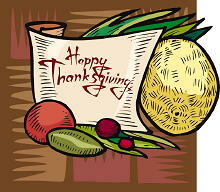 Read updated post about the Feast. We invite you to come and share this special time with us. Every time you SEARCH the Internet, you can quickly, effortlessly and with no cost to you, raise funds for LifeNets scholarships, livelihood development programs, agriculture, orphans, medicine and much more. It's simple. Go to GoodSearch.com. On the line that says "WHO DO YOU GOODSEARCH FOR?" type in LifeNets. Then search. Every click on search item will automatically give LifeNets .01. That means 500 people a day clcking twice will raise $10. A thousand people clicking 4 times will raise $40. It's easy, painless and the Search Engine, powered by Yahoo, is as good as any. You can also add GoodSearch to your Browser Toolbar and make searching and benefiting LifeNets even easier! The Armstrong Maninga family of Mumbwa, Zambia write thank you letter expressing all the benefits through LifeNets. They are one of many families who have been thus helped. Graduation receptions in West Lafayette, IN for Arielle Falardeau and Andrea Pacelli. Family and Friends had a wonderful Sunday afternoon on May 20. Updated Press Release about new LifeNets Project in Kenya for educational and training opportunities for young girls attending scattered United Church of God congregations in Kenya. Outstanding report from Zambia LifeNets Director, Kambani Banda about progress of LifeNets projects in Zambia for the past 12 months ending June 30, 2007. Gladstone and Alice Chonde of Lilongwe UCG Malawi are happy to announce that their son Meshack Chonde and Tionne Nyioringo were united in marriage on May 13, 2007. Father of the groom, Gladstone Chonde officiated at the ceremony. The Indianapolis, Indiana Monon Trail Urban Art Wall Project -- the 2nd picture posted July 29, 2007. Blankets made by United Church of God ladies in the Pacific Northwest are distributed to orphans at the LifeNets Orphan Care Centre on June 20, 2007. Read eyewitness reports and see lots of pictures! Phil Myers and Aaron are arriving home from a phenomenal trip to Africa. Read their latest posts on their TravelBlog. YOU Tube clip worth watching: "Press One for English"
Read Phil Myers' blog of LifeNets Malawi Medical Mission May 29-July 5th. See more on the Mission. Update on LifeNets Southern Africa. See more about LifeNets RSA. Here's another HUGE iceberg that floated by St. John's, Newfoundland David Smith saw this at lunchtime on June 5th. Take a look at a bigger version and the rest of the photos. It's amazing that 90% of the berg is BELOW the water line. This is iceberg season in Newfoundland and our friend David Smith sent us some very interesting photos. Take a look, please. Stuffing Party for mailing out LifeNets Annual Report on June 4, 2007. See blog. A Special Lady: UCG member Ethel Landes of Mulberry, Indiana. A surprise 90th birthday tribute was given to her on Sunday, June 3. See 1 minute streaming video clip. Or other options. Check out our new DATABASE INTERFACE on the LifeNets wheelchair site. You can now search for your own chairs as well as make your donation online. LifeNets Sponsors Medical Mission to Malawi for the Summer of 2007. Three Young Pioneer Volunteers will be headed out May 28. Exciting Trip!! See who's going. With the help of Rotary, LifeNets drills borehole in Blantyre, Malawi that provides water for 1500 people. The well is located on the property of UCG members James and Mary Mapinda. Bev and I visited Malawi and inspected the finished 500 meter security wall around the Lilongwe, Malawi Boys School as Rotary Matching Grant that we had written was completed. This was just prior to the Feast of Tabernacles. This is similar to the wall that is almost complete at the LifeNets Chizeni Clinic in Balaka. Mark Crittenden, Manager of Operations at the Indianapolis Air Traffic Control Center speaks to our Rotary Club on April 4th about the construction of nearly year-old super control tower at Indianapolis Airport. See my blog report. A charming wedding in France. UCG members Laëtitia Bernal and Chad Demarest were wed on October 6th. You've got to see these beautiful photos! REAL video clip. See in STREAMING version. Dennis Ryerson, Editor of the Indianapolis Star speaks to my Rotary Club on March 14, 200. He gave a fascinating speech about what's happening in the constantly changing world of media and information. LifeNets March Story of the Month: LifeNets North Dakota President Pam Redline (right) presents bicycle to Gracia who has polio. More. Hobart, Tasmania, Australia brethren help support LifeNets projects in Zambia and Zimbabwe. Thank you! UCG member Mary Chisevente of rural Mapoko, Zambia receives LifeNets wheelchair delivered by Kambani Banda in January 2007. She has been disabled since age 15, yet continues to work in the fields and walks five miles to church services each week on her crutches. Please read Kambani Banda's inspiring story about Mary. Bev and I had the privilege of meeting her at the 2006 Feast of Tabernacles. 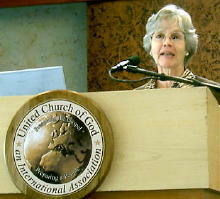 Kim Schuster who attends the United Church of God is an active LifeNets volunteer in the Portland, Oregon area. Read more about her and the Nets Save Lives update. Also see more photos from the first Cherry sale project in the Northwest. Our good friends Wayne and Nancy Stephens of Eustis, Florida survive vicious tornado. Read their account.